I haven't made any ice cream yet this summer, shame on me! I have a pinterest board committed to ice cream, and have not made a one. So when I saw this recipe for Rhubarb and Ginger Sorbet on Mary Anne and Mariel's blog, I knew it would be a perfect choice for Secret Recipe Club. This recipe doesn't even require the use of an ice cream maker, so if you don't have one, don't worry! Just start with a simple syrup, spiked with ginger, add rhubarb, puree and freeze. It is EASY. And, I discovered, it's also multi-purpose -- I sneaked a taste of the "sauce" after pureeing, and it was so delicious warm! It would be a wonderful topping for cake. But if you put the mixture in the freezer, it turns into sorbet! What a great recipe. Be sure to check out Feast on the Cheap for tons of great recipes...and make the most of summer with this fantastic dessert. In a large saucepan, bring the sugar, water and ginger to a gentle boil over medium-high heat, stirring ocassionally until the sugar dissolves. Add the rhubarb, reduce heat to medium-low and cook for about 5-7 minutes until the rhubarb becomes very tender. Transfer the mixture to a food processor or blender and puree until smooth. Transfer the pureed rhubarb to an airtight, freezer-safe container and chill for about 3 hours, stirring occasionally. Alternatively, you can process it in your ice cream maker. 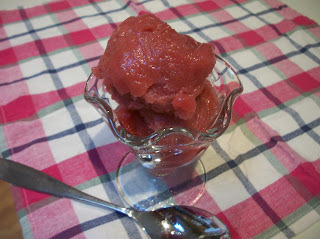 Let the sorbet sit on the counter for 5-10 minutes to soften up a bit before serving. Makes 1 quart. I love rhubarb and ginger anything! This sounds so good. Great SRC choice! I love rhubarb in the summertime. I've never thought to make a sorbet out of it, but this sounds wonderful. Great job! Looks refreshing! I'm not a fan of rhuburb but I'd be willing to try your sorbet! Great SRC reveal! Yummy! This sounds wonderful! I may have to try it sometime. this sounds great! so simple & perfect & flavorful. great pick for src!